I’m not done yet. I still have books to read, another class or two to attend, and I have to write an essay about the experience. It seems like people are most worried about the essay! Um? I think I’ve got that part covered. For me, the certifying births were the big unknown because labor and delivery is really hard to predict, which means I couldn’t really plan for them, and there was no guarantee that I would make it on time. I can control the other things on the “to do” list, but I couldn’t control the births. I also couldn’t control the fact that no one was ever pronounced “four centimeters dilated” when I was working as a doula. There were many women here were dilated to three centimeters and then six, or three centimeters and then five. There was a woman who refused frequent checks (and good for her! ), but she wasn’t checked until she was at 6 centimeters. The problem is that DONA requires doulas to be in attendance at 4 centimeters and beyond for their certifying births. Here’s the thing, as a doula, I don’t really need to be there until labor has become more active. In fact, being there too early can be a bad thing. It’s like the adage about how a watched pot never boils. In most cases, it’s best for women to go about their days or sleep through their nights until the contractions demand their full attention. The births I’ve attended for certification should count. I feel like I was fully there and fully a doula on those occasions. I learned a lot. Most recently I attended my first epidural birth, and yes, they are very different from unmedicated births. And yes, I can see how they can compound complications for the mom and baby. But, you know what? It was fine. And the outcome was fine. And, it’s important for me to know how to doula in those cases too. I’m lined up to attend a few more births as part of my certification *just in case*. My work as a volunteer will also help me gain a lot of experience, and, hopefully, at some point, I’ll be there when the doctor or midwife announces that someone’s cervix is dilated to four centimeters. But, if not, I’m hoping that it will all still count toward certification. It should. Like I said, I’ve definitely learned a lot and would feel right about reaching certification level at this point. I’ve found my voice as a doula, and I’ve received a lot of good feedback about the work that I do. As I’ve said before, I think this is a calling. This entry was posted in doula, life, work on May 15, 2013 by sherewin. Although the occasion was incredibly sad, it was also lovely. The mountains of Utah were at their best and the aspen trees were just starting to make bright green leaves. I had the opportunity to meet more of Z’s extended family. It’s a large and impressive family. The women are especially beautiful and the “aunties” are some of the most confident women I’ve ever met. Watching tens of people standing around chatting with the same noses and same coloring is kind of wonderful. Each one seems to have a musical talent, and they sang and played instruments all day. Years ago, I fell in love with Z immediately. This time around, getting to know his family and seeing their genetic make-up seems more important to understanding who he is. It shouldn’t matter. He hasn’t been around some of these people in years. I know some of my extended family only peripherally. Some people are adopted. Some people choose their family. “Friends are the family we choose,” etc. But, in this case–in our case–these people all matter, family matters and tells part of the story of who we are to each other together and apart. This entry was posted in family, life, love, relationships on May 12, 2013 by sherewin. The first week has been really hectic, but I’m hoping that I’ll get the hang of this pacing soon. Last semester I taught 50 minute classes, which were way too short for me. The summer classes are both two hours long, and that’s way too long for me. I need those lovely hour and fifteen minute classes. That’s where the magic happens. While this week is not one that I want to relive, and I have a ton of work to do in the next few weeks, I think it will be okay. My time in the trenches as an adjunct prepared me for this. I’m not sure if I would elect to do two new preps again next summer, but I think I’ll probably teach in the summers again. I’m just hoping that I’ll get some real vacation time after this semester is over. The thing about teaching is that it never goes away. Yes, the hours are usually pretty good, with some flexibility, but the real workload never ends. Teaching means checking and responding to emails at all hours and grading through the weekends. Yes, I’ll get a month off in the summer, but that month will mostly be spent working on scholarship for publication, which is a requirement of my employment. When I’m not actively working on work, I’m still thinking about work. * I still regularly negotiate the way my time is spent and the way I earn my money because, while it is certainly differently than an 8-hour shift at the plywood mill, academic work never ends. After the eight-hour shift, the rest of your day is your own. That is not ever the case as a teacher. *One of my goals this year was to spend less time thinking about work during non-work-related activities, and I think I’ve improved in that tremendously since I’ve completed my PhD. This entry was posted in family, life, work, writing on May 10, 2013 by sherewin. I’ve wanted to learn to knit for years. My mom does almost every type of craft and DIY home project, but knitting was never one of them. My maternal grandmother, on the other hand, loved to knit and crochet. One of my most prized possessions is a blanket that she knitted for me before she passed away. She made one for each of her grandchildren. Although the blanket is not tightly woven, it is the warmest blanket I have ever felt. Last year, a woman in my graduate program hosted a knitting night. I brought a huge set of straight needles, super bulky yarn, and learned how to knit with a small group of women, who were also in grad school. Since that first lesson, I have made many scarves, headbands, and potholders–all things that involve squares or rectangles. I’ve wanted to expand my repertoire for awhile now. I had a little break this week, and so I took the opportunity to go down to my local knitting store, where they set me up with one very overpriced set of knitting needles on the round and a very overpriced set of double pointed needles. Paying extra was worth it though because I got two really good (informal) knitting lessons out of the deal–something that would never happen at a big box store like Michael’s or Joann’s. This week I learned how to knit on the round and was able to make my first hat! Not only did I learn to knit on the round, I also learned how to knit on double pointed needles, how to knit a hat, and how to follow a simple pattern. All of these skills are going to be really useful as I continue to practice. Now, the hat is sort of a monstrosity. It’s terribly misshapen, has a hole where I missed a stitch, and is way, way too big. I’ll get better, of course, and I’d eventually like to start making baby blankets and hats as gifts since I’m in the doula business now. I also want to be able to make stuff as gifts for family and friends. My knitted gifts are not very good yet (and I’m not just being modest), but I’m bored by most of the stuff available to purchase in stores. So, family and friends will have to bare with me while my skills improve. 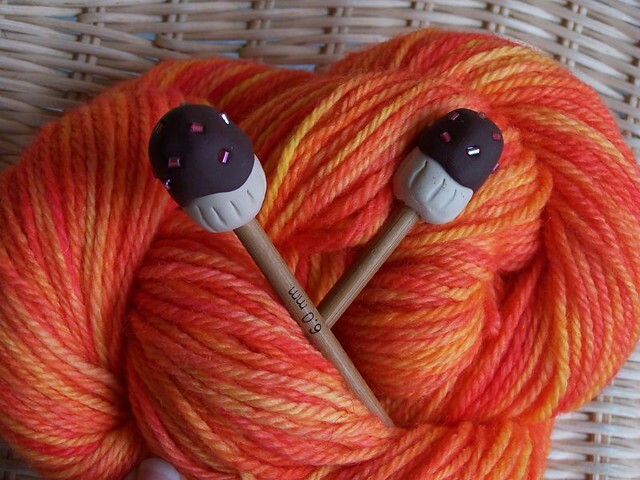 This entry was posted in doula, family, life and tagged double pointed needles, knitting, super bulky yarn on May 3, 2013 by sherewin.